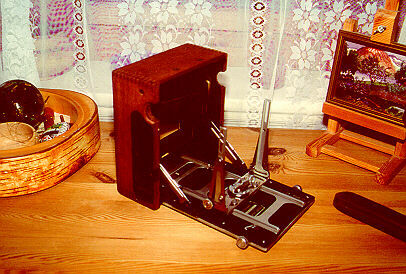 In 1998 I bought a Crown Graphic parts camera on eBay for USD 23 plus shipping. The external hardware and the leather/leatherette had been stripped off. The front panel and lens board were missing and so was the back. The bellows and focusing bed were in good shape, however. On another auction on eBay I bought a Graphic springback. I thus had most of the basic parts for making a neat field camera for backpacking. 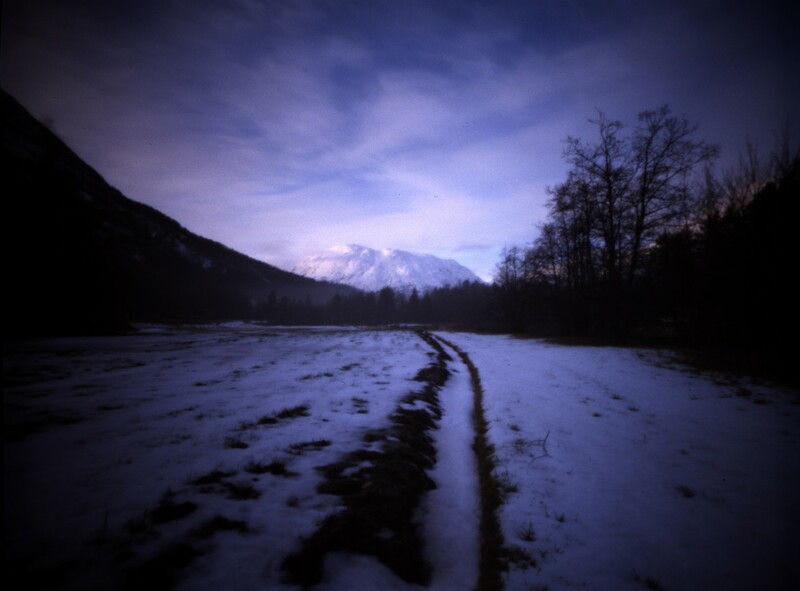 The Crown and Speed Graphic front standards have limited movements but enough for a lot of landscape photography: 15 degrees front tilt for increasing depth of field, more if you use the dropbed option, about 8 mm right and left shift and more than 30 mm front rise – enough for photographing the spectacular mountains on the Norwegian west coast. (Ansel Adams did not know what he missed!) 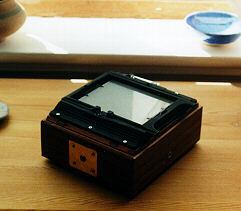 Bellows extension is about 30 cm. 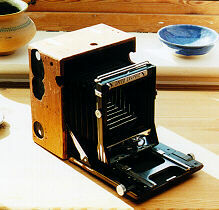 More information on Crown and Speed Graphic cameras is available at www.graflex.org. On my own Crown Graphic I did not modify the front standards but I reversed them to allow forward tilt. The mahogany under the leather/leatherette was nice but had a number of holes from the stripped off hardware, so I put strips of 5 mm beautiful teak on top of it. The tripod sockets were missing when I bought the camera. I made new ones from M10 T-nuts with 3/8″– 1/4″ tripod adapter inserts screwed into them to make the T-nuts fit the tripod screws. Next, I made a new front panel from 2 mm aluminum and 5 mm teak. Lens boards were made from 1 mm aluminum and 2 mm oak strips, and a new bellows frame from 1 mm aluminum. 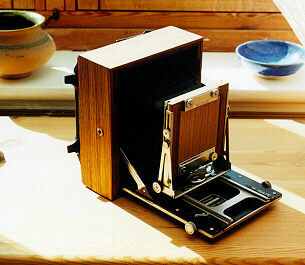 The Crown Graphic now weighs about 1.55 kg, or 3–4 pounds. My next project is refurbishing an Anniversary Speed Graphic camera from about 1945-46. When I bought the camera, the external hardware and the focal plane shutter had been removed. I stripped off the leather myself, and used white spirit to remove the contact glue. One of the tripod sockets had some copper rust which I removed with a mixture of lemon juice and salt. Apart from that the camera was in good shape. 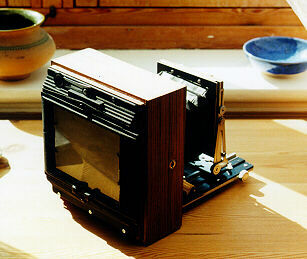 The focusing bed worked fine and the bellows was good. The camera did not have a lens board so I made one of 1 mm aluminum laminated with 2 mm oak strip. I used some strips of 1,5 mm black plastic for the light baffle. The front standards on the Anniversary Speed Graphic do not have tilt (the Crown Graphic does) but the focusing bed can be dropped more than on the Crown Graphic. It also has more front rise than the Crown Graphic. In other words, a pretty good camera for photographing mountains.